If a movie flops, that’s that. If the movie was based on something else, maybe another team will take another crack at adapting the source material after enough years have passed and the floppage has been forgotten. There’s also an outside chance that the movie will have become such a landmark of failure that a squad of improv comics will do a sarcastic stage adaptation of it and (fingers crossed) they’ll get to make a sarcastic remake of the film (see: “The Brady Bunch Movie”). Otherwise, a flop movie is damaged goods and nobody will ever touch it again. “Heaven’s Gate” was a legendary failure. In fact, this movie is credited with causing the collapse of United Artists. I’ve seen three different cuts of the film and I can certify that this is no maligned, hidden gem: it’s awful. It’s like a collection of subplots loitering around the set in search of a story to support. But I regard it as a tantalizing failure. The cinematography is often stunning. The performances are exceptional. The story…is incomprehensible. Yet I get a sense that the writing of the screenplay was going great until it derailed at point (X,Y) and if someone can locate those precise coordinates and apply some course corrections…wow, “Heaven’s Gate” could become great. It’ll never happen, of course. It’s a movie. Dead is dead. Why remake a bad movie when there are so many bad unproduced screenplays waiting to be filmed? Different rules apply to plays and musicals. Theater doesn’t attach stigma to failure; on the contrary, failure is a traditional part of the development process. Launching a theatrical production is like launching a paper airplane. You watch it fail and use that data to build something that will fly. Some producers and directors look at a failed play and see an unsolved puzzle. It sticks with them…particularly if they’re the ones who created it in the first place. And, admirably, theater has no tradition of attaching stigma to failure. “Figure out what’s wrong and try to fix it” is an accepted part of the process. “Merrily We Roll Along” closed on Broadway after 16 performances, bad reviews, and more audience walkouts than most creators like to see. It’s the story of a young, struggling Broadway composer who damages two close, lifelong friendships on his way to becoming a wildly-successful Hollywood producer. It’s the last play that Sondheim includes in “Finishing The Hat” and he does a great job going through the black-box data on the failure. The structure of the musical used the same structure as the 1934 Kaufman and Hart play that served as the basis of the story: the curtain opens in the present-day and as the show progresses, we keep going further back in time. So it was tricky for the audience to follow, particularly as relationships between characters kept changing. A stopgap solution: have the characters wear tee shirts with a description of their current relationship with the main character (“Ex-Wife”) actually written out on them. The characters are in their Forties at the start of the show and in their early Twenties and late teens by the end. The production had the idea of casting college-age actors and having them play younger over the course of the evening. The problem there (Sondheim writes) was that there aren’t many 20 year old actors who can play anything other than their 20-year-old selves. He described the audience reacting to the opening scenes of “young adults playing jaded grownups” as if they were watching a college production. Which, Sondheim says, was an intended effect but it didn’t play with the audience the way he thought it would. The most interesting note that Sondheim makes is the “time moving backwards” structure of the show interferes with the audience’s sympathy for the main character. When they meet him, he’s rich, at the top of his profession, kind of a jerk and a shallow phony. It’s hard, then, to sympathize with him as they see him screwing over his friends and disconnecting from his creative passions in subsequent scenes. By the very end, when the audience sees the young and idealistic composer complimenting his friend’s play and suggesting that they work on a musical together…they’re supposed to compare and consider this likeable underdog and the jerk he became, and see the tragedy. It’s all there, but (never having seen the whole musical, myself) I can imagine how the overall effect requires more of a contribution from the audience than they might have been prepared for. 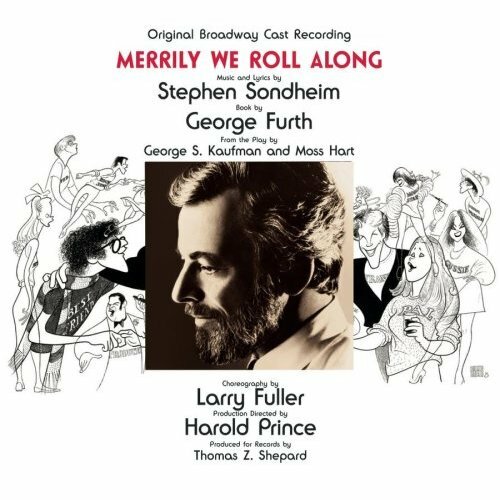 The book describes all of the problems that were identified and addressed over the decade of different productions that Sondheim worked on before he considered himself satisfied with “Merrily We Roll Along.” That’s an interesting relationship with a work, isn’t it? It feels like that scene in “Seinfeld” where George is humiliated by a co-worker during a meeting, and then he keeps trying to re-stage those exact circumstances so that he can use the devastating comeback that came to him later on. You don’t get to do this in real life but as a theater composer, when you later think “You know what that character should have done?” you can do something about it. This “Seinfeld” reference also allows me to mention that Jason Alexander was part of “Merrily”‘s original cast. In fact, when Sondheim writes about the mistake of casting inexperienced young actors, he singles out Alexander as the only one capable of playing a 40-year-old. “It’s as though he had been born middle-aged,” he wrote. And damn, the man has a terrific voice. You’ll recognize him instantly in “Opening Doors” as the theatrical producer that the two composers audition for. “Opening Doors” is practically an entire musical play in itself, with a beginning-middle-end arc and character development throughout. It’s also emblematic of why it took me a long time to warm to Sondheim. You know what I mean? Lots of shifts in tone and melody and place, and characters who are clearly going through a lot over the course of a single song. Lots of stacatto declarations. Overall, Sondheim is the only composer who can get a character to commit adultery, confess to his wife, abandon the daughter his mistress gave birth to, and then wonder if he should accept his daughter’s invitation to her new gallery opening after thirty years of estrangement…all within the margins of a single nervous ballad. I’m not saying that this observation was off-base. In many cases, it’s spot-on. 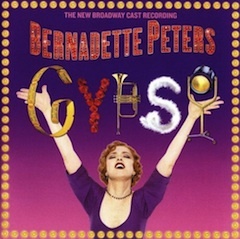 I guess what turned me off about these types of songs was that I heard them done so poorly by so many Sondheim pretenders and parodists that I wasn’t leaving my mind open to the solid features of the original. Sinatra and Elvis Presley recordings have the same problem. It’s hard to lock your memories down on the originals any more. He has a point. I’ll still take Sondheim over Jerry Herman any day, though. “Penny In My Pocket” will take me nicely through the wetdown/soap/lather/scrub/rinse/shampoo/lather/rinse/conditioner/set/rinse cycle. But leaves me with a somewhat emptier feeling. Preview “Opening Doors” on the Amazon MP3 Store. Yes, I know…you can also get it from iTunes and elsewhere. But anything you buy on Amazon after clicking this link results in my receiving a small kickback in the form of Amazon store credits, which I assure you will be spent on foolish but fun things. See my other music postings if you liked this one and have time to waste. Damn. This is the third Monday in a row that I’ve chosen a show tune as an Advent Calendar selection. We all have a little bit of OCD in us and something now compels me to simply designate Monday as permanent Show Tune Day. Hey, no problem: I have dozens of favorites. But how will this affect my quarterly P&L? Does my usual Monday traffic respond to content of that type? Can I compensate for any dips in the metrics with some more finely-targeted SEO? I really don’t know. I barely can explain what any of those terms mean. But writing a paragraph like that makes me feel like kind of a big shot and there’s every chance that paragraphs like that one will elevate me to the sort of speaking gigs where rich people hope to get even richer. The buffets at those kinds of conferences tend to be exceptionally good; in addition to my speaking fee, $5 for a box of store-brand Ziploc baggies can parlay itself into saving three weeks’ worth of grocery budget. It kind of breaks my heart a little. It’s such a damned shame that these legendary productions dry up and blow away after the original cast moves on and the show closes. You can buy “Riding The Bus With My Sister” on DVD. You can see “Family Guy” every hour of the day or night on multiple cable channels. It’s cheap, low-grade horsemeat but it’s on film and it’s on video, so it’s going to be preserved somewhere. Live theater? It was made to be seen live. From both a creative and a legal point of view. I made this lament to one of the many people in this world who are smarter than I am and they explained that it’s not as simple as plonking a few cameras on tripods in the theater and hitting the “Record” button on them before the curtain goes up. Everyone on the stage, everyone in the orchestra, and everybody behind the scenes has a financial stake and the negotiations between all of the respective trades to make a video production happen generally aren’t thought to be worth the trouble. It’d be easier to move a suspension bridge a bit to the left. So: if you want to see that episode of “Two And A Half Men” where one and a half of the men have a farting contest inside a closed car and the one man loses when he craps his pants, you’re in luck because it’s in a boxed set. If you want to see the 1992 revival of “Guys And Dolls,” well, that’s just insane. I’m picking this specific song chiefly because I heard something absolutely wonderful about it last week, during a “Fresh Air” podcast in which Michael Feinstein talked about the career of Frank Loesser…the show’s composer. I already knew that Sam Levene, the show’s first Nathan Detroit, was hired for his skills as a character actor. He was an awful singer. What I didn’t know, and what was absolutely stupidly obvious when Feinstein mentioned it, was that Loesser baked a melodic support system into his one big song. Not only are all of his notes in the same octave…but the melody “walks” him up to the right note. If Levene had to simply sing “Sue Me…” he’d have been completely off-key. “Hire-A-Law-Yer-And…” lets him dialing it up closer and closer to the “real” lyric. Isn’t it neat? This kind of machinery was lurking inside this song all the time, unnoticed by me. Stage music is full of tricks like that. Like Loesser, Mozart had to write music for “The Magic Flute” that would help a very weak Papageno get through his big aria. The orchestra plays his entire melody before he has to sing it…and it ends on the note that he has to start on. It’s a built-in cheat sheet! Mozart’s first Queen Of The Night, on the other hand, was his sister-in-law and a renowned soprano. Listen and you’ll notice that she gets no help whatsoever from the orchestra. If anything, the orchestra has to keep up with her. Meanwhile, the composer is throwing everything at her he can to make sure that she dies a deathly death of dying. 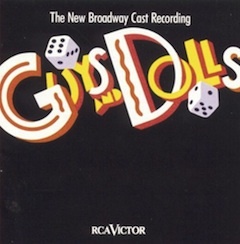 Listen to “Sue Me” (From “Guys And Dolls”) on the Amazon MP3 Store. When you click that link, any purchases you make during that Amazon session will result in my receiving a small kickback in the form of Amazon Gift Credits. I shall use them to buy silly, but manifestly wonderful, things. It’s possible that you’ve never gone to a play or a musical, so I’ll just need to explain two things. Okay? 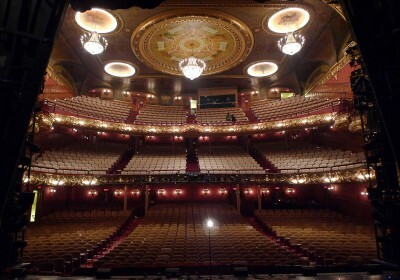 You ought to go the theater and see a show every now and then. I acknowledge that it’s kind of a big deal to spend $30-$80 on a theater ticket. To say nothing of parking, dinner, five bucks for a gin and tonic in the theater bar during intermission, four bucks at the newsstand across the way because you’ve just noticed that People’s “Sexiest Man Alive” issue just came out and you still don’t know if you made the cut this year or not. But really, your first show is something you look back on as one of those slap-on-the-head, why-didn’t-I-do-this-sooner moments. And if you’re visiting New York, there’s absolutely no excuse. Wait in line at the newly-refurbished TKTS booth in Times Square for an hour or maybe 90 minutes and you can take your pick of a dozen or more fine shows at half-price on the same day of performance. If you’re willing to show up even earlier, you can practically take your pick from the full menu. Secondly, there’s sort of a natural arc to these things. First, you see the show. Three days later, you come across the folded-up Playbill in your coat pocket or the kitchen counter where you dropped it when you came home. You spend the rest of the day humming the songs, and the day after that you go and buy the cast album. 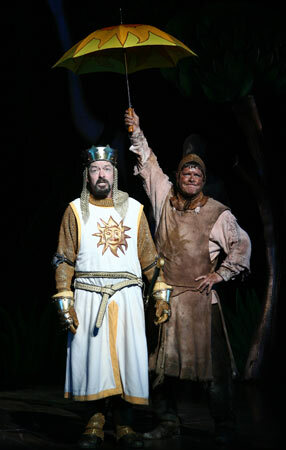 “Spamalot” is a lot of things. It’s A Musical Based On A Movie™. It’s an anthology show of favorite Python bits. It’s a show of new Python material (it was co-written by Eric Idle). And it’s a send-up of Broadway. To anyone who’s ever heard an Andrew Lloyd Webber song — mmmm, yes, that should cover most of you — “The Song That Goes Like This” is hysterically funny satire. It’s also probably the highest compliment that Lloyd-Webber’s music has ever received, in that it proves that there really can be a piece of music that’s even tackier, more overwrought, and more glib than a song in an Andrew Lloyd-Webber musical. “The Song That Goes Like This” is a hell of a lot of fun to sing. When I saw the show in Boston a couple of weeks ago, Ben Davis and Esther Stilwell were obviously enjoying themselves. On the original cast album, Christopher Sieber and Sara Ramirez are obviously enjoying themselves. And dear readers, every time it’s come up on Shuffle Play on the iPhone mounted in my car…I’ve enjoyed myself to the point of punishing my passengers. Or you can buy it from the iTunes Store. But it’ll be 128K and copy-protected. And I’ve read that part of the proceeds will go towards producing another season of “According To Jim.” So let your conscience be your guide.